Potassium is the third most important macronutrient for human life. Together with sodium and magnesium, potassium participates in the transmission of bio impulses, thus regulates the electrical conductivity of the heart, muscle, gastrointestinal tract and participates in maintaining of normal brain function. A large portion of potassium is excreted through the kidneys (urine) while small part is eliminating through the digestive tract. Therefore, the kidneys are extremely important in the metabolism of potassium, precisely because they participate in maintaining the balance of potassium in the body. What are the Health Benefits of Potassium? Physiological role of potassium is to provide a smooth flow of bio electrical impulses through nerve cells, so potassium affects the proper maintenance of the heart, brain, nerve and muscle cells, as well as muscle cell of intestines. In addition, potassium also has a metabolic role in the body, as it encourages the creation of the proteins, participates in the metabolism of glucose. Potassium is a precursor in the synthesis of the growth hormone and much more. Extremely important role of potassium is in allergic conditions and in the process of detoxifying the body. 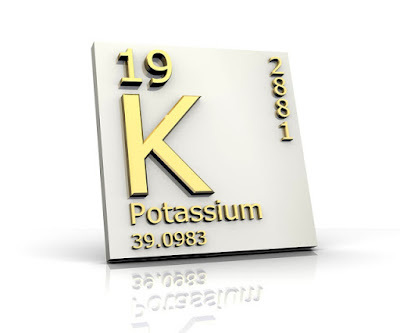 Knowing the physiological properties of potassium, it can be said that sufficient quantities of potassium in the body provide protection against cardiovascular diseases, especially hypertension, then prevention of the formation of kidney diseases, stomach disorders, and according to previous researches, potassium has connectivity in the prevention of osteoporosis. Foods contain sufficient quantities of potassium, therefore, potassium deficiency mainly line in normal conditions of nutrition and life. What we need to indicate, is that the heat treatment of food has big influence on the lost more than half of the present amount of potassium. It is therefore advised to use foods rich in potassium in fresh state. In addition to the ingredients of natural origin, potassium can be replaced by supplements. In the form of supplements, potassium is in the form of salts and it is commonly combined with other electrolytes in order to compensate electrolytes after training. When using supplements that contain potassium you should be careful, because it can lead to overdose, so the medical advice before use is desirable. Which are Daily Doses of Potassium? There are different opinions around the daily dose of potassium, and it is depending on the author, starts from 2000 to even 8000 mg daily. It is assumed that the potassium intake of 2000 mg is optimized to meet normal physiological needs of body for this electrolyte. Certain pathological conditions, such as diarrhea, increased sweating, vomiting, disturbed metabolism, use of drugs (diuretics) can lead to a state of deficiency or increased loss of potassium from the body. Extremely low levels of potassium can create longer use of steroids and laxatives that are often use in training, as well as the application of inadequate diet. The emergence of heightened levels of potassium occurs in kidney patients since the kidneys are unable to maintain normal levels of potassium. Also in the elderly, due to physiological deterioration of the body, can come to a reduced excretion of potassium from the body and retention.